Utah boat rentals, wakeboard boats, ski boats, power boats & fishing boat rentals for the boating & water sports enthusiasts. Charter boats, jets skis, & houseboat vacations available in Utah & Arizona. Improve your skills at any level. Come with us and catch the wave and try the hottest thing in water sports. Try our advanced wake enhance system. We even offer boat handling. TK Watersports covers all lake and reservoirs in Utah, Arizona, Idaho, Nevada, Wyoming and California that will allow motorized boats, water craft or Watersports activities. 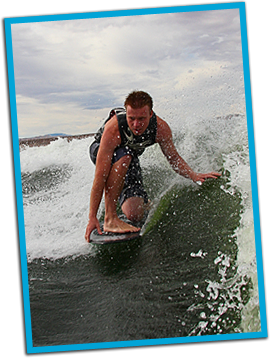 Welcome to TK Watersports offering the best in Utah boat rentals & water toys including wakeboard boats, ski boats, personal water craft(PWC)jet ski rentals, RV rentals, boat charters, Lake Powell houseboat rentals, wakeboard and water ski lessons/instruction and much more. Looking for something new and exciting to liven up those Utah summer months? Let Utah's premier Outfitter bring your summer to life. Experience the rush of being pulled behind the latest in wakeboarding boats with top of the line water sports equipment. Whether you are a beginner or just trying to take it to the next level, TK Watersports can make it happen. We service all Lakes in Utah with extented service to lakes in Arizona, Nevada, Idaho, Wyoming and California. Some of the lakes include Lake Powell, Utah Lake, Deer Creek, Yuba Lake, Bear Lake, Jordanelle, Lake Mead, Sand Hollow, Mohave, Lake Havasu, Strawberry reservoir, Willard Bay, East Canyon. We can handle delivery to most lakes including, but not limited to Lake Powell, Lake Mead, Lake Mohave, Utah Lake, Yuba Lake, Sand Hollow, Deer Creek, Jordanelle, Lake Havasu, Bear Lake, Strawberry Reservoir, Willard Bay, East Canyon, Flaming Gorge, Lake Shasta and many more. TK Watersports will accommodate your watercraft,waverunner, wakeboard boat rental, water ski boat rental or power boat rental needs in Utah, Arizona, Nevada, California, and Idaho. Let us take care of the driving and clean up with our VIP boat rentals/water sports charters so you have nothing to worry about but having fun. Service to all lakes in Utah with power boat rentals, wakeboard boat rentals jet Ski rentals Including: Lake Powell boat rentals and Glen Canyon National Recreation Area, Utah Lake, Deer Creek Reservoir, Bear Lake, Yuba lake, Jordanelle Reservoir, Sand Hollow Reservoir, Willard Bay, Pine View Reservoir, East Canyon Reservoir, Scofield Reservoir, Starvations Reservoir, Strawberry Reservoir, Flaming Gorge, Echo Reservoir, Electric Lake, Huntington Reservoir, Mantua Reservoir, Mona Reservoir, Navajo lake, Gunlock Reservoir, Hyrum Resorvoir, Millsite Reservoir, Otter Creek, Palisades Reservoir,Quail Creek Reservoir, Red Fleet Reservoir, and Rock Port. Service to all cities in Utah with utah boat rentals & jet ski rentals. We cover all Cities in Utah including Provo, Richfield, Riverton, Roosevelt, Roy, Salina, Salt Lake City, Sandy, Santaquin, Smithfield, South Jordan, South Ogden, South Salt Lake, Spanish Fork, Springville, Saint George, Sunset, Taylorsville, Thompson, Tooele, Torrey, Tremonton, Vernal, Vernon, Wallsburg, Washington, Washington Terrace, Wellsville, Wendover, West Haven, West Jordan, West Valley City, Woodruff, and Woods Cross City, American fork, Aneth, Ballard, Beaver, Bingham Canyon, Blanding, Boulder, Bountiful, Brigham City, Cedar City, Centerville, Clarkston, Clearfield, Coalville, Corinne, Cottonwood Heights, Dammeron Valley, Delta, American fork, Aneth, Ballard, Beaver, Bingham Canyon, Blanding, Boulder, Bountiful, Brigham City, Cedar City, Centerville, Clarkston, Clearfield, Coalville, Corinne, Cottonwood Heights, Dammeron Valley, Delta,Deweyville, Draper, Duchesne, East Carbon, East Millcreek, Enterprise, Ephraim Utah, Eureka, Fairview, Farmington, Ferron, Fillmore, Garden City, Grantsville, Green River, Grouse Creek, Gunnison, Hanna, Myton, Naples, Nephi, New Harmony, North Ogden, North Salt lake city, Ogden, Orem, Panguitch, Paradise, Paragonah, Park City, Payson, Pleasant Grove, and Price. Visit TK Watersports other location websites; for Lake Powell goplaylakepowell.com in Utah Utah Boat Rentals.blogspot.com. Welcome to TK Watersports! Your connection for your watersport and vacation rentals.